How To Avoid Incompetent Lawyer? Sometimes it may be difficult for clients to know whether they should fire their lawyer; and while they have the right to do so, it may not always be in their best interest. Clients should know signs of a bad and incompetent lawyer and if hired lawyer has that characteristics he or she should be fired. The most important thing to remember is that most lawyers are good. They will have worked hard for many years to pass the bar and be qualified to practice law. However, not every lawyer is the best choice. Lawyers specialise in different areas, and personalities come into it to. You must be able to communicate with and trust your lawyer. A good lawyer/client relationship is essential. 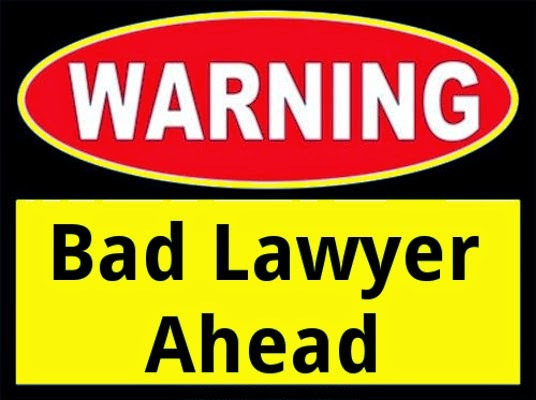 When this does not happen, problems can occur and this is usually when a lawyer is labelled as 'bad'. It is also worth remembering that if a lawyer loses a case, it does not mean they are bad at their job, it just means the other side won. This can be difficult to accept if you are on the losing side, but it is how it works. Having said all that, you can make your life much easier by choosing a brilliant lawyer from the start. Hiring a reputable lawyer who has an excellent reputation and a fantastic track record will put you ahead right from the start. It is widely known that even in the most serious criminal cases, having the very best attorney will make a huge difference to the outcome. A good lawyer will not keep you waiting, especially where criminal charges are concerned. As soon as you have been charged, ask for a lawyer. If you have one, ask for them to be contacted, if you do not have one you could be assigned one or your family could help you find one. The most important thing is that there should be no delay. If a lawyer does not get back to you or takes a long time to respond to your request for help, move on and find another. In criminal cases there is no time to waste. Do not be pressured by any unscrupulous lawyers who try to 'sell' you their services. Unfortunately there are still some lawyers that pay for referrals of new clients. This is regarded as illegal in most states so if you experience this you can report it. Do not work with lawyers who engage in these activities. Lawyer violating statutes or laws. Failing to inform a client of an offer made by the other party. A lawyer has an obligation to inform clients of the existence and availability of alternative resolution procedures. Representing parties who have a conflict of interest, without informing each party of the conflict. Lawyer violating statutes or laws. Forming a personal relationship with a client. Not keeping a client's personal property separate from his or her own property. Withholding information to serve the lawyer's own interest or convenience. Lawyer is not giving your case the appropriate amount of attention. After all you must determine if the lawyer is still acting in your best interest. If answer is negative than you must find a new/better lawyer.